Once again it's been awhile since I've had taken a spare second to sit down and write a post. I really have enjoyed consistently blogging for the last few months, but this past month with all it's craziness has made it very hard. Let's be honest, I could normally manage my time a little better, but when there are a bunch of shows on our DVR that we haven't watched, it means that we really have been busy. We've been doing a lot of driving back and forth between Louisville and Nashville lately. We found a place to live which turned out to be quite the headache. Not a fun experience at all. In the end though we ended up finding a house and a townhouse and after applying for both we decided to go with the townhouse over the house. They are both about the same size, but the location of the townhouse is much closer to Adam's work. We are talking 8 miles and a straigh shot. Also, the home was being rented through a realty company and not very well kept up inside. The rental agents were rude and seemed annoyed with us asking questions whereas we had the opposite experience with the young couple who is renting our their own townhouse. There is one drawback, poor Kaiser is going to go from a 45 acre farm to a house with no yard. This was the only thing that held us back from the townhouse, but everything else was telling us that it was the place for us. In the end, we decided that we are just going to have to make a point to get out and walk him morning and night and take him to the area parks. He is our first son after all. The area we are going to be in has a lot of parks and a huge reserve were he can swim and both him and Landon can play. It's going to be an adjustment for him, but we are only renting and if we don't like it after a year we can always move...again. Another reason we've been making frequent trips to Nashville is my job search. I've been applying for everything under the sun. Logstic jobs, administrative jobs, event coordinator jobs, etc. At first I thought if I was going to leave UPS after almost 10 years then I would get a job in a field that I really enjoyed. I don't meet the requirements for travel agent positions so I applied for a number of event coordinating jobs. However, I quickly realized that my current skill set either wouldn't get me a job or would get me one that paid close to nothing. It's really frustrating knowing how great of an employee you are and how perfect you would be in a field, but not be able to prove that on paper and therefore never hearing anything back. I was starting to really stress out and wondering if I would ever get a job. After applying at over 30 places I've had two interviews. One over the phone for a company I would die to work for, but has a crazy long hiring process and one I was over qualified for and just didn't pay enough. Then on Sunday, I came across an opening at a logistics firm I heard about from my privious interview. I applied and by Monday I received an e-mail to take their online assesment, I did so Monday night and Tuesday they asked if I could come in for an interview on Wednesday. Wednesday I went for the interview and was extended an offer on the spot. YAY ME! It isn't traveling the world, so it's not my dream job, but I really like the people I interviewed with and got a great vibe about the company. Plus, I do find the industry interesting and know that the potenial for growth is unlimited. Now I can continue studying for my brokerage license as well. But the best part is that they are a Swiss company headquartered in Basel with locations in over 80 countries! When people find out that we are moving they are pretty surprised. When I tell people what our long term goal is, most of them laugh. It's actually kinda of annoying, but I get that we are really different from most people. I think most people laugh because they think we are joking or think it seems impossible or maybe even ridiculous. To us its not. Our dream is to live in Switerland. Probably not permanently, but at least for a couple of years. I'd like to be there in the next three years about the time Landon will be starting school. When we come back to the US we'd like to live on the West Coast, ideally Seattle. Adam knew in order to get to Switerland he'd have to go to a large accounting firm with offices wordwide. One of the big four or at least a top ten firm. The firm he is going to is a top ten firm and happens to be the largest accounting firm in the banking industry. 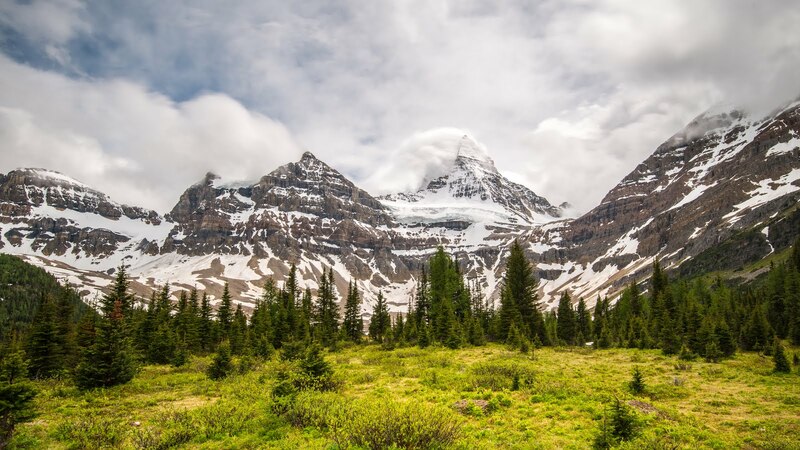 The best way for an accountant to get a job in Switzerland? Through banking. And his firm just so happens to have offices there as well. When I left that interview Wednesday afternoon knowning I had a job offer coming my way from a Swiss based company I really left like all the stars were aligning perfectly for us. Now I realize that our goals could change between now and then. We may love Nashville, buy a house and never want to leave. On top of that, life is crazy. You CAN NOT predicit what will happen tomorrow. I, of all people, truly do get that. That being said, we've always been very goal oriented and this is OUR dream. We've always had clear goals, both long term and short term and done what we could to accomplish them. Do they seem crazy to other people? Maybe. Do they seem unlikely? Maybe. Will we learn/grow/change and in the process alter our goals? Of course. But the most important thing is that we have something we are working toward. Which allows us to building our lives for a purpose and not live day to day. 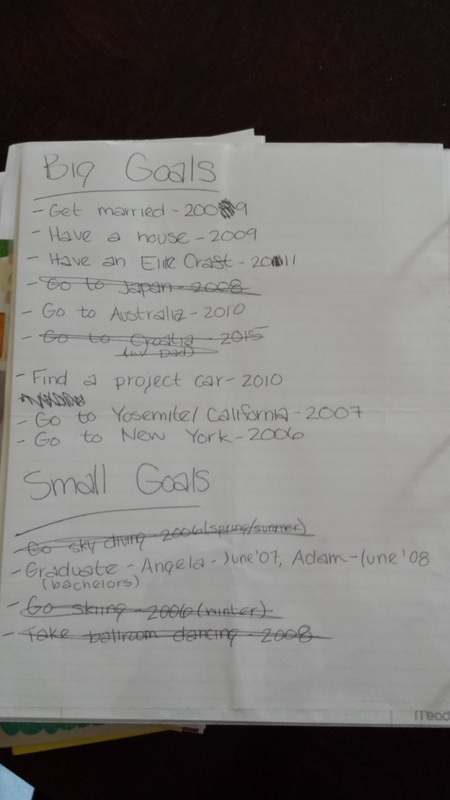 In my most favorite possetion, which I talked about it in THIS post, one of the items I have from our early dating years is the first goals list we made together. I wish I had dated it, because I'm not exactly sure when it was made, but I'm guessing it was 2004 or 2005. It could have been as early as 2003 though. It's funny to look at this list now. We didn't accomplish them all as of yet and some of them I'm greatful we didn't. A project car? What was I thinking? We did get married, buy a house, go to Japan, go to Croaita with my Dad, we went skydiving, we both graduated, went skiing and took ballroom dancing for several years. When I look at this list, knowning what I know now, I'm happy we made it and that we did most of it. I still want to own an Elite Craft (that's a boat by the way), go to Australia, Yosemite/California, and to New York. Maybe one day even have a project car...maybe. I feel blessed that we've had these last 8-9 years to be able to cross those items off and many of them we did before the year we had set. I know that we've grown and changed and our goals list today looks a little bit different. A little more adult and somewhat boring. But I think having goals no matter how big or small, trival or serious is what is really important. On one of my trips to Nashville I was listening to Dave Ramsey and he said "Have a goal that is bigger than today's desires." I want to print that quote out and frame it right next to our front door so I can see it everyday when I leave the house. On Monday, Adam starts his new job in Nashville and will be living with some friends until our townhouse is ready. I put in my two week notice at UPS on Thursday and my last day will be the 29th. Then it's down to Florida for a week to rest and have a some fun before starting my new job on September 9th. There is a possbility that our townhouse won't be ready until September 14th, but at some point between now and then we will also be moving. On top of that I still need to find a daycare for Landon and I know from my past experience, it isn't always easy either. These next few weeks being seperated are not ideal (we are that disgusting couple joined at the hip) and will probably be a little stressful (at least for me), but Adam and I are both so very excitied to continue this amazing journey of life and do whatever it takes to get us to our goals. Stay tuned.